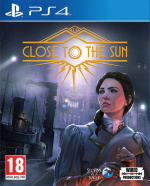 Close to the Sun is a brand new horror title, announced at Gamescom 2018, and it looks pretty cheesy. The game is set during the 19th century, and scientist Nikola Tesla has created a ship complex in pursuit of knowledge. Of course, it hasn't gone all that well, and playing as journalist Rose, you must survive as you explore the facility to figure out what went wrong. The trailer hints at plenty of puzzles to solve as well as gruesome baddies to avoid, and it looks fairly decent. We're not sure how scary it'll be, but there's plenty of time to learn more before the game comes out early next year. Getting a Bioshock/Puzzle vibe from this, might keep an eye on it. Not really my thing to play by the looks of it, but it depends on just how much of a puzzle game it is, since I quite like those. Srs Bioshock Vibes in this game will keep my eye on it. same, to my own surprise. @b1ackjack_ps @get2sammyb Same...hopefully the puzzle games aren't too hard since I normally don't care for this type of genre. I think I heard that part of the team is composed of former irrational games employees but I haven't found any proof of it.